CarGurus has 26,735 nationwide HR-V listings starting at $10,999. 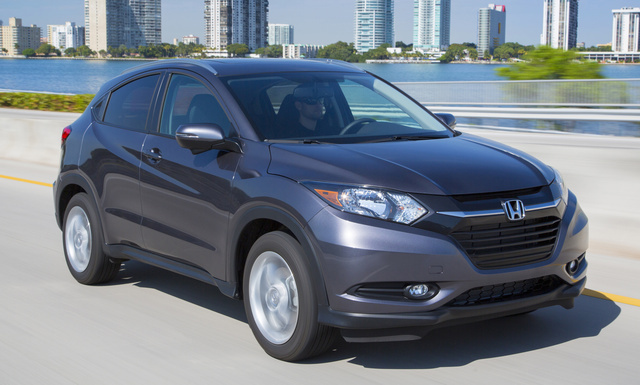 The Honda HR-V was new for 2016, so this year's model is a carryover. It sees only the addition of Luna Silver metallic paint to replace the discontinued Alabaster Silver. The HR-V might be the new kid in the Honda stable, offering a choice between the CR-V and Pilot, but this crossover has already drawn big attention--it was named the 2016 Green SUV of the Year by Green Car Journal. 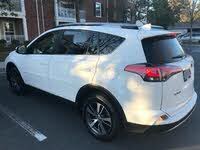 Fuel economy varies slightly based on the trim level you choose, but at its best, the Honda HR-V achieves 28 mpg city/34 highway/31 combined. Standard features include 17-inch alloy wheels, a push-button electronic parking brake with automatic brake hold, a rear-view camera with guidelines, and Bluetooth HandsFreeLink. Power for the HR-V comes from a 1.8-liter 4-cylinder engine with 141 hp and 127 lb-ft of torque. It’s paired to either a 6-speed manual transmission or a continuously variable transmission (CVT), with a choice of either front- or all-wheel drive (FWD or AWD). If you want that manual transmission, however, your choices are more limited. It’s only available in FWD and you can’t get it on the top EX-L trim level at all. That CVT helps the HR-V get good fuel economy, but the price is a somewhat noisy engine that sounds strained, especially in hard acceleration. The National Highway Traffic Safety Administration awarded the 2016 HR-V a 5-star overall rating, which carries forward into 2017. Standard safety features include antilock brakes with brake assist and hill start assist, vehicle stability assist, and tire-pressure monitoring. The standard multi-angle rear-view camera offers normal, top-down, or wide-angle views, so you can be sure you get a good look at what’s behind you when the car is in reverse. The EX and EX-L trims also have Honda LaneWatch. This unique feature activates anytime the right turn signal is engaged, displaying an image of the area to the right of the vehicle to help avoid accidentally hitting any low objects hidden from view. There is seating for 5 passengers in the HR-V. Honda’s second-row Magic Seat offers a 60/40-split configuration that folds flat into the floor. This makes loading cargo, especially longer items, much easier. There’s also a low floor height so you don’t have to lift heavy objects quite so high to get them loaded. FWD trims have 24.3 cubic feet of cargo space behind the second row and 58.8 cubic feet behind the first row. Those numbers drop slightly in AWD versions, to 23.2 and 57.6, respectively. Either choice offers a crossover with plenty of room for passengers and the flexibility to handle cargo. The standard infotainment system includes a 160-watt AM/FM/CD audio system with 4 speakers and a 5-inch color LCD screen. Higher trims come with a 180-watt system and 6 speakers as well as a 7-inch high-resolution touchscreen display. HD Radio and SiriusXM Radio are also available. HondaLink lets you connect your mobile device to easily stream music, access social media, and even schedule service appointments. The base LX gets a single USB port, while the EX and EX-L each get two. Convenience features increase as you move from the base LX to the EX. This trim adds in heated front seats and mirrors, smart entry, push-button start, and automatic climate control. Head all the way to the top and the EX-L Navi offers SiriusXM and HD Radio, leather-trimmed seats, satellite-linked navigation with 3D renderings of terrain and buildings, and roof rails. Pricing on the base LX with FWD and the manual transmission is $19,365. Sitting at the top of the HR-V lineup is the EX-L Navi with AWD and the CVT, for a price of $26,140. The 2017 Honda HR-V is arriving at dealerships Fall 2016. What's your take on the 2017 Honda HR-V? 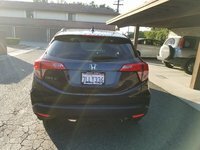 Users ranked 2017 Honda HR-V against other cars which they drove/owned. Each ranking was based on 9 categories. Here is the summary of top rankings. Have you driven a 2017 Honda HR-V?